Designed and built for those of us who want to simply disappear when we get close to our quarry, the Phantom 3D Leafy Jacket is a leafy concealment piece in both Fusion and Cipher that allows the user the very best in 3D camouflage. With features like extra burly YKK zippers and printed mesh, this is the one leafy top that is built to last. The Phantom is designed and sized to fit over whatever you're wearing in the field and can be worn in any weather over your layering system. Great piece of kit that provides additional concealment and outline breakup. Is light and easy to throw on over you normal layers for the given conditions- does add a small amount of additional warmth to factor into your layering plan. Remove the loose leaf material near the zipper- constantly gets caught in the zipper teeth. I did this with scissors but could be a future design fix. Adds good to this piece for more versatility. I use this for spring gobbler and it is a real problem solver. No matter the temps or weather, I can throw this on over whatever I'm wearing and immediately blend in without having to buy a dozen shirts or jackets. Fit is spot on with my normal size. I'm a large in just about everything and this is no different. This thing is great for spring turkey. Very lightweight and surprisingly durable. I’ve put it through it’s paces in the turkey woods. If you literally want to disappear while hunting gobblers or archery hunting whitetail, slip this leafy shirt on. It's practically weightless. It's breathable. You become invisible. Take it slow on the zipper tho, it does have leafy fabric hanging about. Can we get some pants? Used this jacket along with the corresponding balaclava for turkey hunting this spring. Called in a tom to 20 yards and two hens to 3 yards!!! while I was sitting on the ground with no blind and was not spotted. Super lightweight and I am convinced makes you invisible! The Phantom jacket and balaclava are now the only cammo I will ever wear for spring turkey. I used this to bag my first turkey. He got within ten yards of me and never knew I was there. This has nice pockets, which were handy for my face shroud and gloves while on the move. The only thing somewhat annoying was the zipper. Hard to not fit. Pretty big. The leafy fabric will likely get caught up in the zipper at some point. The material seems like it'd be prone to snagging and tearing easier than I'd prefer. But it breaks up odd human-like figures which is the reason I use it for CA turkey hunting. I'm a tall and lanky guy. There's a lot more girth per unit of height you get out of wearing this. I was looking for top that would conceal me during spring gobbler and also early season whitetail when a tee shirt would be enough. This top accomplishes all of the above and more. The wind can blow right through it making it a great option in addition to simulating the leaves blowing that are still on the trees. Construction is durable enough for getting in and out of the stand but also quite enough not to sound like a rustling ball of leaves. Flexible and stretchy enough to be warn over any pice making it a year round option as well. Elastic wrists keep it from dropping over hands making it very functional in the stand or on the ground. Had 8 does and 2 bucks at 30 yards come up on me while still hunting through woods. Good wind and good camo and never looked my way. Great outer-layer. Good fitting, pretty good pockets. True to size. A little loose in the early season but you need that when layering later in the season. First and foremost, remember that this piece is made to go OVER your other layers, so it will be cut a little wider than you may expect. Just keep that in mind, and buy accordingly, because you definitely want to have one of these. This jacket really rounded out my turkey kit. It's breathable, which in Maine isn't always a huge deal, but there are days in the turkey woods where it gets (what we call) hot. I could imagine hunters South of here [read: every other state on the East coast] would greatly appreciate the lightweight aspect of this. The pattern (fusion for me) is exceptional. The material can snag up depending what you're getting involved with in the woods, but I wouldn't consider it to be any more than I expected. Not enough to be a problem--but just enough to warrant mention here--still a five star product. When paired with the leafy balaclava, I swear you'd have to be the damn Predator to spot someone wearing this in the woods. Just keeping in mind that it's meant to fit over your other layers, it's true to size, and fits as I'd expect. I got this piece for spring gobbler and literally had turkeys come within 10 yards of me and had no idea of my presence. I definitely credit this piece to my tagged out spring gobbler season and my freezer full of delicious wild turkey meat. Very lite but durable material that packs down small when not needed. Pair this with the phantom balaclava and become invisible. Love the 3d jacket! You literally disappear in the deer woods. And, the mesh helps with the ventilation in a hot early season. Please make the matching 3d leafy pants!!! This is a great addition to add more texture to your outer layer, it really takes the human silhouette away and I can’t wait to see how this piece works for turkey season. I've been close enough to whitetail and mule deer to jump on while wearing this. Durable, easy to pack, doubles as an insect barrier (mosquito) during those early to mid season bow hunts and let's me get close. Wear a lightweight top below and you're ready for that 80 plus degree hunt while pairing with the corrugate guide pants. I absolutely love this piece of gear, It works amazingly. I have had deer look rigjt at me & not have a clue I was there. The only problem is the zipper. Feels cheap, sticks, gets hung up. As a functional concealment piece would give this five stars. Used the jacket and the mask in the turkey woods just sitting at the bottom of a large oak, have had whitetail upwind as close as ten yards without spooking. Another nice thing about it is it's a great hot weather piece. Throw on a short sleeve t-shirt and the Phantom and your pretty comfy in the heat. Breeze cuts through it nicely as well. This zipper is not my fav. I'm often putting this on in the dark and zipper tracks will get caught on the 3d fabric surrounding it. Same can happen when taking off in a hurry. Not a deal breaker just has happened enough to be a concern. Will probably remedy this by taking some scissors to the 3d bits near the zipper. Perhaps buttons would be better suited for the Phantom. I give the top a 5 star rating but since First Lite isn't offering a matching pair of pants, and that leaves me 50% exposed, it's knocking the rating down by 50%! Why in the world would you offer a "suit" without pants?? That's just crazy for a camo company. It'd be like offering all shirts and jackets and no pants! Lol! PLEASE fix this error First Lite! This has the potential to be the best 3D suit ever made. I'm wearing my top with my old Mossy Oak leafy wear pants - until First Lite comes to their senses. Lol! This is a great piece of camo for hardwood bow hunting in the fall and early season turkey before green up. On one hunt this year, several whitetail deer walked 10 feet in front of me at eye level and they had no clue I was there, The camo does its job and does it well. Also, the phantom leafy is light weight and is a great top layer alternative for someone who want's to layer cold weather gear that is not designed for hunters (e.g., colorful down ski vests and the like). So the phantom leafy is an effective way to achieve top notch concealment without spending $2K on a whole new camo set up. I like that...it makes great camo more accessible. All that said, I have run into two slight issues. First, and least important, the Phantom is synthetic and seems to retain human odor a bit. It therefore needs to be washed pretty aggressively - Not a deal breaker at all...most whitetail gear needs to be washed repeatedly anyway for sent control. Second, and more important, I used the jacket and head net on just about every every hunt this year ( roughly 40-50 days in the field). Though the camo is great, the zipper is a bit shoddy (at least it was on my kit). It broke early on which was disappointing. I sewed a few buttons on as a substitute and kept using it and it has otherwise been pretty durable. For the cost and weight one can't expect the phantom leafy to be bulletproof, but probably best to be aware of the zipper issue before purchase. Bottom line though, if you want to disappear and shake hands with a whitetail, the phantom leafy will get you there. This top is the perfect fit for hot and humid weather found here in Hawaii. Could be used alone or with a light undershirt. Fusion camo pattern is excellent for all terrain. The pattern is also printed on the mesh. Top quality zipper as well as some basic hand pockets. Highly recommend this product. Treestand hunting with this jacket has been great. It breaks up your outline without being bulky. I also like that the pockets line up with the pockets on the FL puffy vest. Great product. Sizing was true. For years I've been wearing my solid color First Lite gear under a leafy suit. 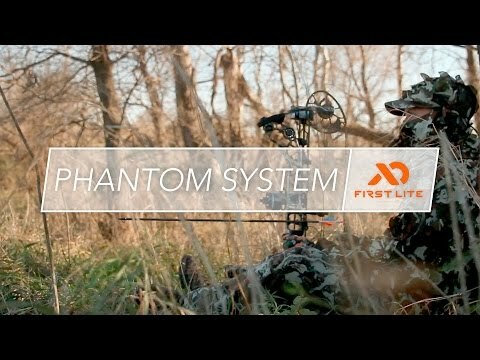 I have been hoping that First Lite would come out with one, and they have not disappointed. The zippers are better than I ever expected, and this works great no matter the weather. Thanks! In preparation for Arizona's August deer archery season I purchased the Phantom Leafy Suit Top and namesake, matching head balaclava as spot and stalk Coues deer hunting in the South Eastern section of the state provides little cover to prevent a wary Coues from bolting. There isn't much for high quality, serious camouflage available for seriously warm, humid weather that will have temperatures well into the 90s if not the triple digits. But the Phantom Leafy Suit Top and balaclava were identified as really a netting undergarment that the leafy, very realistic leaves are sewed to. And having received them I am very impressed, as they will be as light and airy as really can be expected, and the camo leafy material is incredibly realistic in a slight breeze...which is almost always present in the late Arizona summer. Being 6ft 3 inches tall I was concerned that the Suit Top may not be long enough in the sleeves, especially in the distended position at full draw, but I was pleased to find the sleeves were really perfect for my physique. At this point, with our deer season 15 days off, I'm more than confident that the Phantom Leafy Suit Top and balaclava will perform to my spot and stalk requirements as I actually put both on and entered state range land across the road from my house. I had my wife watch me while I'd crawl a few feet in the 18 inch high grass, and then peek my head above the grass as I do in a normal stalk. And my wife said the Phantom suit really did eliminate the obvious figure of a man and looked like a small bush or brush with leaves waiving in the breeze. So I'm very impressed with the lightness, fit, and finish of both the suit and the balaclava, and I hope to report back later that they helped me harvest a nice Coues buck with my bow. Well done First Lite...well done. this phantom leafy top is the best camo piece on the market to date. I have been closer to more animals with this top than ANY camo I have ever owned. It is light weight, breathable, durable, holds its color wash after wash. I have put it to the test on Turkey, elk, deer, and other people in the woods, and have been close enough to actually reach out and touch these creatures before noticing me. It is that good.